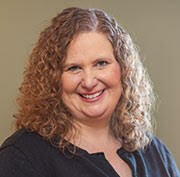 Lisa is a Licensed Marriage and Family Therapist and a Spiritual Director/Retreat Facilitator. She holds a Master of Arts in Clinical Psychology from Azusa Pacific University in California, and a Master of Arts in Christian Spirituality from Loyola University Chicago. In Lisa’s dual role as a psychotherapist and a spiritual director she explores the impact of faith and spirituality on ones’ emotional and relational well-being. Lisa desires for people to reflect on and deepen their relationships with God, with themselves and with others. One important dimension of faith is how a person's image of God impacts her sense of self and her spiritual life. Engaging the work of Catholic Theologian Sister Elizabeth Johnson, retired professor of theology from Fordham University, Lisa will help us consider how the voice of one Catholic woman theologian can open new ways of understanding and relating to God as women created in God’s image.